Florida has a late primary, August 28-- a couple weeks before this year's harvest moon (September 14). If you win this contest you'll have your own harvest moon in time to celebrate. Blue America is doing a contest/give-away to benefit Alan Grayson's campaign for Congress in Orlando. 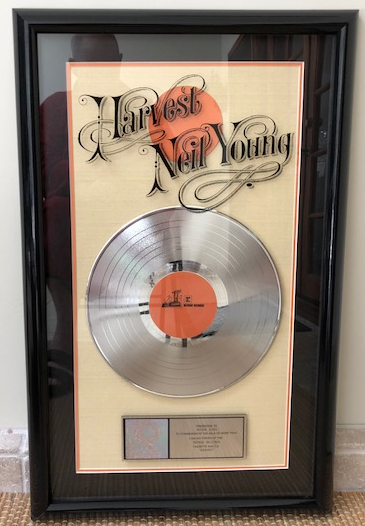 The winner gets a very rare and very beautiful RIAA-certified double platinum award for Neil Young's release of Harvest.​ You can't buy one of these in a store, no matter how rich you are. A limited number were produced for Neil and his band, his staff and a few people who helped promote the album. If you're a Neil fan-- or if you know a Neil fan... this is completely primo. "Every once in a while, Neil Young makes a special appearance in my bedroom. Not personally; just his music. My wife is a huge Neil Young fan, she has a spectacular voice, and every once in a while, she treats me to a Neil Young lullaby. "The Needle and the Damage Done," "Ohio," "Down by the River," "Rockin’ in the Free World"... whatever it is, she makes it sound magical. Thank you, Neil Young, for inspiring her to inspire me." Meanwhile, helping Grayson-- a lifelong fan of Neil's music, by the way-- get back into the House is something that will be good for our country and for working families everywhere. I can't think of anyone-- and I mean anyone-- who will be a more effective bulwark against Trump and Trumpism than Grayson. So this is how it works: This is the page. And like we wrote there, there is no minimum to be eligible to be entered into the random drawing to win the plaque. 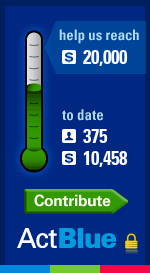 A $20.18 contribution has just as much chance to be selected as a $1,000 contribution. The contest ends at 9 in the evening (PT) on Saturday, July 21. if you don't have the cash to give and you want the award, you can enter too-- just send a note to us at Blue America, P.O. Box 27201. Los Angeles, CA 90027 and you'll have the same chance as everyone else. There's an excruciating FEC rules diatribe here which I doubt anyone has ever read besides a couple of lawyers. Easiest way of all to get to the page: the Act Blue Neil/Alan thermometer on the right. This is a win-win for everybody-- except Trump and except Putin.